Wanderings in Chinese Turkestan is a traveler’s journal, written by the artist, adventurer and author E.G. Kemp (1860–1939). It is about a journey along the Chinese trade route across the mountain ranges of Karakoram. The journey begins on August 17th 1912. At the Karakoram Mountains, Kemp visits the frontier fort of Shah-i-Dulah after which Kemp and her companions continue on the highway until the 7th of September and arrive at Kiliang, the first town in Turkestan. The author gives a detailed account of the houses in Kiliang, which according to her are architecturally similar to Chinese houses, as well as people’s clothing and their local food. From Kiliang the travelers continue their journey towards Yarkand. 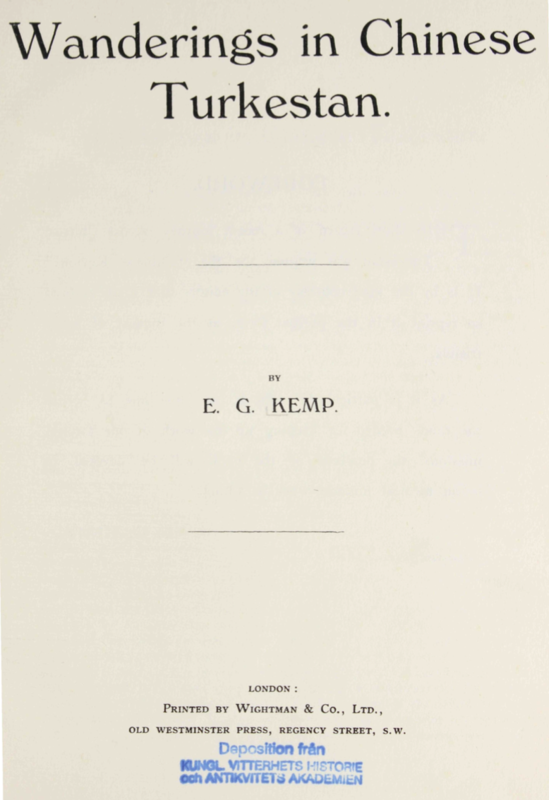 With regard to the great number of people visiting them and all the gifts that are presented to them, Kemp’s guide and translator Habib characterizes the trip as “one long holiday”. A brief section is devoted to the villages they visit on the road to Kargalik – a halting place between Kiliang and Yarkand – which is said to be very hot and sandy. In Basherah, one of these villages, the travelers are greeted with a large feast. An illustration of the visit to Basherah can be seen on pages 8 and 9. When Kemp finally arrives at Yarkand, she describes the city as most picturesque and writes about the 30-40 feet high walls surrounding the city. At that time many of the people in the city were sick with goitre from the bad water. There are several illustrations of Yarkand and descriptions of foods, buildings, walls and people’s clothing. After their stay in Yarkand, Kemp begins the 125 miles long journey towards Kashgar. Halfway between Yarkand and Kashgar, they come to Yengi Hissar. From there on, they cross the four branches of the Kashgar River before they reach the city. Kemp writes at some length about the history of Kashgar and in another section about the importance of silk and clothing. From Kashgar the author describes the journey across the Alai Mountains and provides some illustrations of the surrounding villages. Finally they visit two villages, the last one being a Russian frontier site called Irkestan. After crossing the Terek Dawan pass, they end up at the railway terminus in Andijan. Throughout the traveler’s journal there are pencil sketches drawn by the artist herself illustrating her travels. Publisher: Wightman & Co., Ltd.